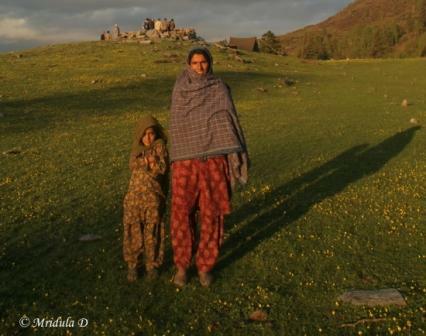 The mother and daughter visited our campsite at Dhunda in search of medicines. It is very common on a trek to be requested for medicines by Gujjars. I don’t know why the people living high up the mountains are called Gujjars. They have nomadic lifestyle, they build temporary shelters and move with their livestock to the places where food is available for the cattle. So this pair came for medicine for fever as the father was having fever. The camp leader gave them the medicines after a conversation. In the hills one of the most common request at the end of the trek is to give away your common medicines. And for that reason a trekking doctor is all the more valuable.